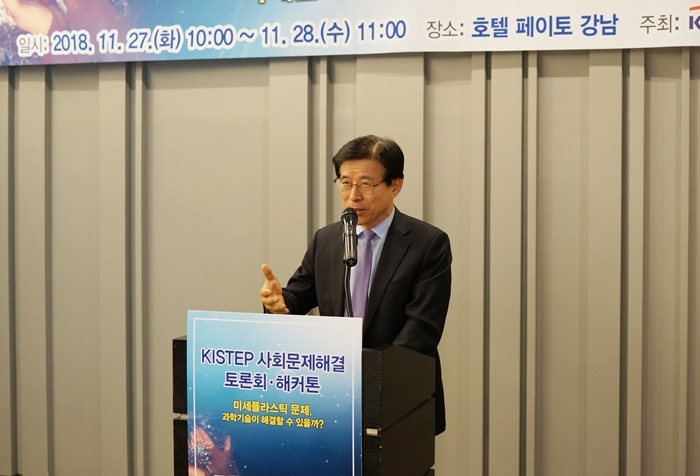 KISTEP (President Sang-seon Kim) held social problem-solving forum·hackathon with the theme of ‘The Problem of Microplastics, Can Science & Technology Solve it?’ at Hotel Payto Gangnam on November 27th (Tue) and 28th (Wed), 2018. Recently, social demand for science & technology is increasing to solve social problems that are closely related to people’s lives and to improve the quality of life of people. KISTEP arranged a forum and hackathon to provide a platform to discuss measures to solve the problem of microplastics in-depth through science & technology, as the problem has emerged as a major environmental issue worldwide. 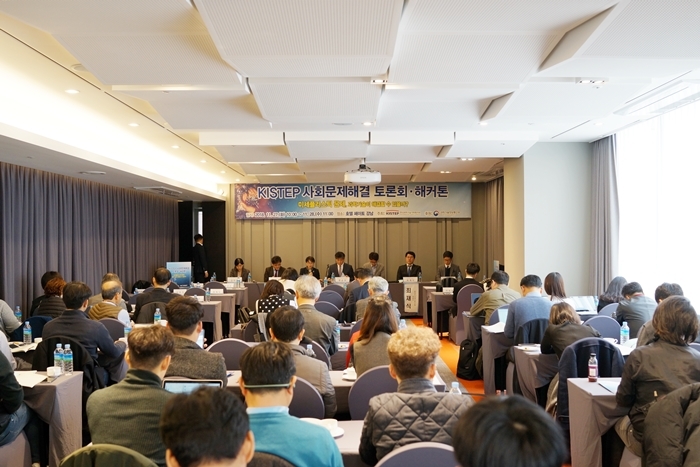 The event consisted of ▲forum (27th) that shared the problem of microplastics and ▲hackathon (27th ~ 28th) that allowed in-depth discussion on detailed solutions for the problem. Keynote presentations consisted of ▲(Presentation 1) Microplastics, plastic pollution that threatens our food safety, and its solution (Team leader of Plastic Campaign, Greenpeace) ▲(Presentation 2) Social awareness and possibility of scientific and technological solution to the problem of microplastics (Director Seung-Kyu Yi, Center for Social Innovation Policy, KISTEP), and then panel discussion with experts and open-ended discussion followed. In the panel discussion after the keynote presentations, Chairman Soon-Cheon Byeon (Director General, Office of S&T Policy Planning, KISTEP) and panels including Jae-Hyun Nam (Reporter, MBC), Jeong-Gue Park (Chief Research Fellow, Korea Environment Institute), June-Woo Park (Group leader, Korea Institute of Toxicology), Jaesik Choi (Lawyer, Korea Institute of Intellectual Property) participated and discussed about the role of science & technology to solve the problem. In the Hackathon, about 20 people participated including R&D managers·researchers, consumer organizations, and researchers in relevant regions and discussed ways to establish a solution system that would resolve the problem in the view of a cycle - from a cause to a social issue - based on KISTEP problem analysis report.